When marketing consultant Peter Hodgson risked $147 of borrowed money to introduce a bouncing putty to the world, his target audience was adults. As that market dwindled, it was kids lifting newsprint that made him shift gears. The once-failed product that was created in hopes to help the war effort turned into a multi-million dollar industry. 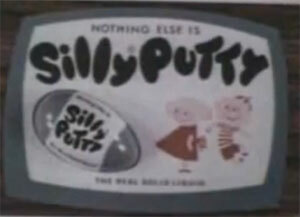 The original Silly Putty commercial was one of the first television ads geared specifically toward kids. Like many early commercials, it ran a full minute, and featured commentary. How did you use Silly Putty as a kid? Were you a bouncer? A stretcher? A Sunday comics lifter?